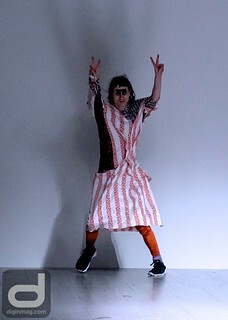 During London Fashion Week 2018, fashion designer Matty Bovan (Instagram: @babbym) revealed his unique world with his Autumn / Winter ’18 collection displayed on the British Fashion Council runway at 180 Strand. 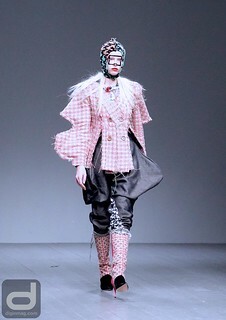 For London Fashion Week AW18, Matty Bovan, in his first solo show, showed guests his new designs in which the primitive meets the unearthly. 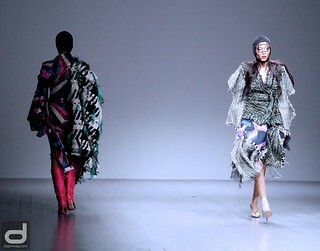 His collection was inspired by a dreamy glimpse across the North Yorkshire Moors at dusk from the window of a car. Feelings of romance and isolation stirred him to create a collection with earthy brown and twilight violet colors. Bovan’s late grandmother, whose wardrobe was filled with tweed suits also directly inspired the shapes and textiles that are seen in his collection. 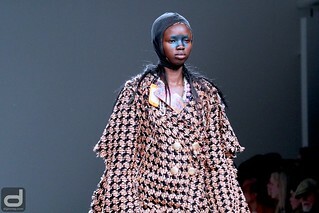 We saw thinly hooded models with geometrically-designed face painted eyes strutting the catwalk in layered and wrinkled pieces with rough and smooth textures where the edges are left ragged. The designs possessed patterns and contrasting colors that perfectly clashed. 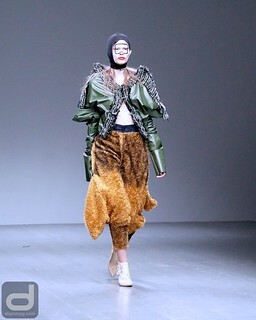 Oversized coats with ends cut to shreds, baggy multi-layered skirts, top-heavy bubbled parachute pants paired with knee high boots were displayed. 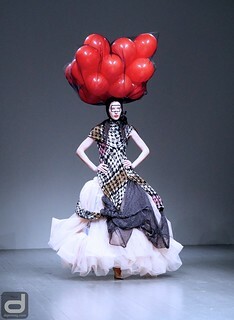 And a bouquet of helium-filled balloons grouped together as floating headdresses drifted above the tops of models wearing puffed tweed and lightweight laced chiffon dresses. 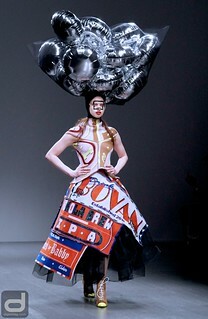 One metallic-colored balloon decorated model struts in a rounded skirt with the designer’s name prominently printed in a large font along with other adversarial words with varied styled letters. A model sports an above-the-ankle trouser made of soft faux fur that recall not only mink, but roadkill on a remote country road. We see colors of burnt rust yellow paired with deep forest green and blouses with Bovan’s signature square shoulders and an open midriff held together by an oversized safety pin. 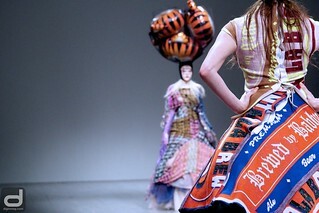 Another model wears a light rose and black patterned tweed dress with various lengthed shredded threads hanging down to the catwalk floor held together by four large beige-colored circular buttons. We also admired a model, almost fully covered except for a tease of her neck and fingers coming out of a checkered black and white pant suit, sporting a tightly cinched brown belt surrounding her waist, which is actually a part of her purse strap. She also wore a matching hood clasped around the neck, which complimented the suit. In addition, she showed off in shiny reflective gold and red pointed laced heeled boots, a shocking contrast to the rest of her B&W look. Cindy Maram is Founder, Editor-in-Chief and Publisher of Dig In Magazine. She is an accredited film journalist for Cannes Film Festival in the South of France, Venice Film Festival in Venice, Italy, Sundance Film Festival, Tribeca Film Festival, Mill Valley Film Festival, San Francisco International Film Festival and CAAMFest, as well as fashion & style photographer/blogger for London Fashion Week and New York Fashion Week, professional sports photographer/writer and art critic. She is a writer, vlogger & social media community manager possessing a B.A from UC Davis and a M.A. in Mass Communications + Popular Culture Studies emphasis in Film/Marketing/Writing from Cal State Fullerton.